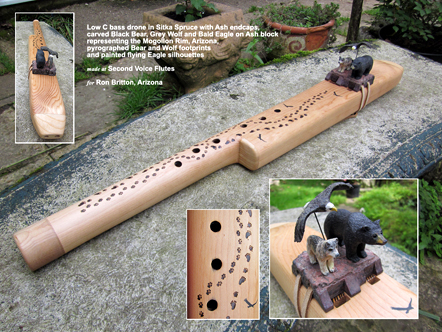 Back in 2009 I was asked to make a flute with a Robin as a totem, or power animal, on the flute block. Not having done such a thing before, but being aware that many flutemakers could produce the most magical creatures as totems on the block, I felt obliged to have a go. This was the start of a huge learning curve; carving a block from pictures or the real thing (what I call life-carving) was something I found to be a slow process....the art of carving wood is a long way from the art of making a good sounding flute! I will not tell you how long it took me to carve that first totem...but it was a long time, and there was plenty of wood going to the fire along the way. Since then, the people that the Universe has brought to my door have also brought with them a near constant series of requests for seemingly ever more complicated and challenging totems. Of course, I realise that this is the way the Universe is helping me learn and re-wire my brain. And while life-carving is still, for me, a slow process, often involving a lot of research and image-hunting even before the carving, it has taken me from thinking "I can't do that" to the point of realising that I can. It has also made me see that such blocks are an integral part of the flute; the Spirit of the animals I create very rapidly becomes entwined in the overall Spirit of the flute for which it has been created, and augments the link to the player's Energy. And there in comes a major point... I have been asked to carve all sorts of blocks, some of which you can see below. However, I have reached the point now where there are some blocks that I will not carve... more specifically those power animals or symbols whose energies do not complement the flute. For this reason alone I now prefer to discuss a block carving before agreeing to do it. I must also make customers aware that a carved block will lengthen the time taken to complete their flute as they usually take longer to make than the flute body! Of course, not everyone feels the need for a carved block, and I still make many flutes with simple stylized blocks. That said, I would stress that the quality of the sound of the flute is still paramount to me; the voicing, how responsive and expressive the flute is, how easy it is to play, how it's energies work with player and listeners are the fundamental criteria for me. 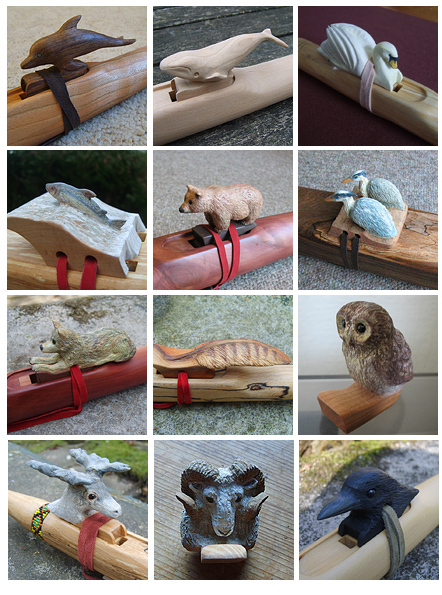 Below are some of the latest...many of these can also be seen on their respective flutes on the Custom Flutes page. As you can see, they go from the straightforward (eg. Owl and Dolphin) to the exotic (eg. Swan-morphing-into-a-Dragon and Salmon leaping up a water rush) and then to the outlandish (see the Wolf/Bear/Eagle block!). There is also the option of head or whole-body, or part of the body (eg. feather). For a closer look, just click on each image on this page to open a new larger window. If you wish to see how I go about creating a life-carved block, then click here to go to relevant Workshop page. Click the image below to see the range of basic stylized blocks available. Almost all of these blocks can be flat-fronted, arched-fronted, half-chimneyed or full-chimneyed depending on the voice required and the use of the flute. For example, recording is best with flat-front blocks as these give the purest sound; novices often find the half-chimney blocks help them develop breathing control by holding the bottom (fundamental) note stable; outdoor playing is often helped by a full-chimney block which minimizes air disturbances around the sound hole. My goal for each of the life-carved totems is to make them just that... as life-like and accurate in attitude, texture and colour as possible. This takes a bit of planning, and it often takes quite a long time to get the block right. I mean this not only from the point of view of carving the totem itself (it can often take longer to make the block than the flute body! 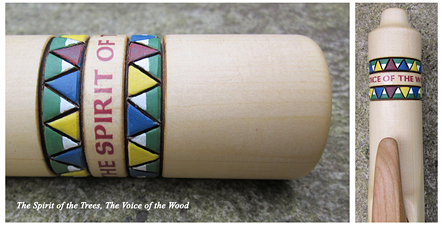 ), or deciding where and how the leather tie is going to go (over the block or through a hole), but also because the shape of the front of the block (flat-front, half or full-chimneyed, arched etc) is vital to getting the right voicing and sounds from the flute and this can affect the position and attitude of the totem. Furthermore, all of the blocks are carved in one piece; I do NOT carve a totem and then glue it on to a block. For all these reasons, I ask all my customers to understand that these special custom blocks take a lot of work. Talking of which.... this must be the ultimate block! For the full story, see the Custom flutes page. Ancient and Native Carvings have recently become some of my favourite subjects for blocks. I was first asked to do a copy of an Otter carved by a Haida artist who had done it for the handle of a rattle. The next request was for a copy of the famous Raven and the First Men by the Haida artist Bill Reid. Click the image to open a new page with a larger image, and click here for the official tour video of the original sculpture in Canada's Museum of Anthropology. I made this flute for my good friend and superb flute player Dario Ristic, who has kindly made a video of the flute at https://www.youtube.com/watch?v=GRTSGYtKC64. More recently, I was asked to do a copy of the Swimming Reindeer carving that featured in the British Museum's Ice Age Art exhibition. Click the image to open a new page with larger images, and click here for the BBC/British Museum's page about this fantastic 13,000 year old object. Artwork (called 'Accents' in the US) is another area that I have come to do more and more over the last few years. I am not a natural artist, but again this is something the Universe has clearly decided I should persevere with to help my brain re-wire, or at least not degenerate at a rate of knots! Painting on curved surfaces presents some challenges but the effects can be dramatic. The examples below show something of the pieces I have been asked to create recently (again click for enlarged view). Again, there are many more examples of painted accents on the Custom Flutes page. Blockwork and Lettering is a new addition to the range of accents I now do. This is unique to SVF flutes, and features traditional pyro-cut and painted patterns (such as the tipi pattern on the flute below) which can be combined with a completely new way of 'melting' inked lettering into the wood, giving a beautifully professional finish. I have to admit I prefer this technique to pyrography when doing typefaces, but the latter also has it's place in barrel designs, as one the flute opposite. I am always open to new ideas for flute decoration or blocks and welcome suggestions!